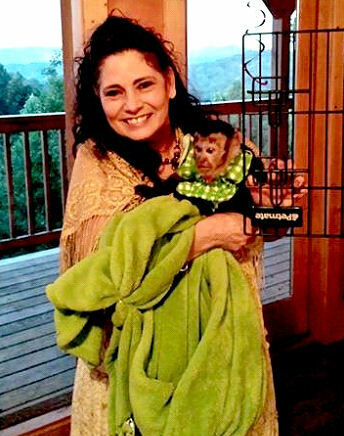 Due to the recent changes with the rules and regulations in many of our states across the country, the issue of keeping our monkey’s safe and under control has become very important. When an accident happens and a monkey gets away or when something worse happens, the media is right on the story immediately. It is evidently big news to many but to us as monkey caregivers, we begin to think about what we would do if this happened to our beloved monkey. The next things that enters into our minds is what is another incident going to do to the already challenging situation that we have been dealing with due to fearful people and the activist who are working to push more regulations and changes for us monkey caregivers. Are you using the proper safety procedures and equipment for your monkey? Let’s find out! I thought it might be a good thing to work from “The List” so that each one of you could rate your own answer to this important question. We must always remember that monkeys are smarter than we think and they just love to copy many things that we do. They are little Houdini s’ when it comes to being escape artists, too! Does the safety equipment that you are using to take your monkey outside or in your car get used properly each time? Do you make sure that the belly bands, chains, cords, etc. are properly locked and pulled tight for optimal safety? Could an accident happen with the type of pull down clip or fastener you are using on the lead to connect it to the waist bands, chains, cords, etc? Do you carry an extra set of safety equipment to tether your monkey with in case an accident happens and there is an escape? How do you connect the lead to your body? Is it a safe tether or do you just have your hand through the end of the lead as you would to use it to walk a dog? Do you carry the documents of your monkeys health care and ownership when you go out in public? Do you let other people take the lead of your monkey without hooking the lead up properly to that person? Are you always checking and rechecking your monkey’s safety equipment? Do you carry a safe, secure, crate for your monkey to go into when it is needed while you are away from home? Are you constantly reading the energy of your monkey while you are out with them? Do you know when your monkey is uncomfortable with their surroundings or the people, animals or sounds they are encountering while they are away from their home? Do you put the safety and well being of your monkey first when you are making your decision about taking them out with you and your family? 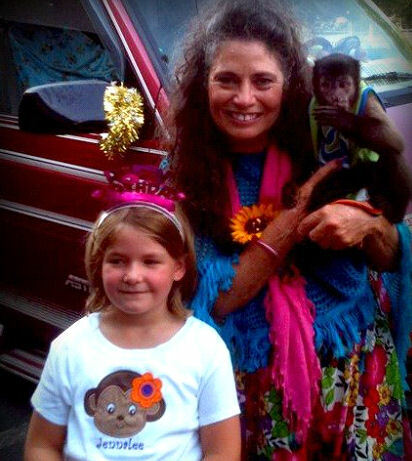 Do you loose your peace of mind when it is time for you to leave your home with your monkey? (or when you must leave them at home)? Do you wish to feel more comfortable about the safety of your monkey? This list is important to think about if you wish to safely take your monkey out into the world. Please start to think about the things on this list and make necessary changes if you are not pleased with your answers to these questions. 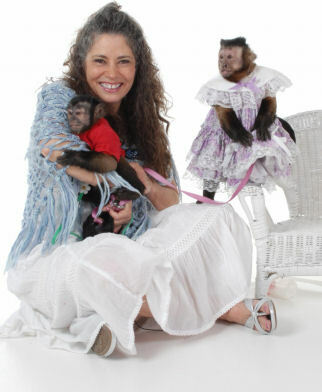 Having a monkey and living with them in your home has changed now in the US from the way it was years ago. When a negative incident happens with someone’s monkey (during this time in our country) it affects all of us who have monkeys. We all know how the laws are changing from state to state, and maybe nationally in the near future. Notice the silver bracelet on my right arm. I have the end of the lead clipped to it with a scissors clip for safety. I do not use pull down clips because they are absolutely not safe for a monkey, no matter what size they are. I am also holding Silly Willy’s tail. He would say, “Mama is not letting go of me.” LOL. I am a “Safety First” kind of Monkey Caregiver! The safety equipment that you choose to use on your monkey is their lifeline. We monkeys caregivers wish to be able to continue to have them with us in our homes as long as possible. Please choose to use the proper safety equipment such as locks on their waist bands or using u-links that can be tightened down. My own personal type of safety equipment (which I have been using for over 25 years) is heavy duty deep sea fishing swivels with a squeeze lock connected to the bottom of the ball bearing swivel. I have always felt that my monkeys are safe to take out since I began using this type of locking device. I connect them to the end of the lead and then connect them to the belly band or maybe their collar. I have faith in these types of safety closures. My hands are very strong so I am able to easily lock and un-lock these locks. Become familiar with what your options are to choose from and remember that the safety equipment must be changed as they are growing and becoming stronger. The better job that you do in choosing your safety equipment, the more peace of mind you will have, when you are away from your home with your monkey. We must all become wiser and more educated about safety issues with our monkeys. Slow down and take the necessary time to check and re-check your monkey’s safety equipment before you take your monkey away from your home. None of us wish to be the next one to have our monkey lost or taken away from us, and we certainly do not wish for their picture to be spread all over the media, as our heart is breaking. When we spend the necessary time and effort to follow our safety routines every time we tether our monkeys, and choose their equipment wisely, then our natural fear of loosing them is diminished by a large percentage. When we are happier, then they are happier too. They are constantly reading and responding to our energy and emotional changes all of the time. Thank you for visiting us here at Primate Care. We are all committed to bringing good information for you to think about and share with your family, friends, and other monkey caregivers. In next months posting I will continue to write more about “Safety First” and I will also be sharing with you a possible plan that you might one day need to follow – if your monkey were to escape.